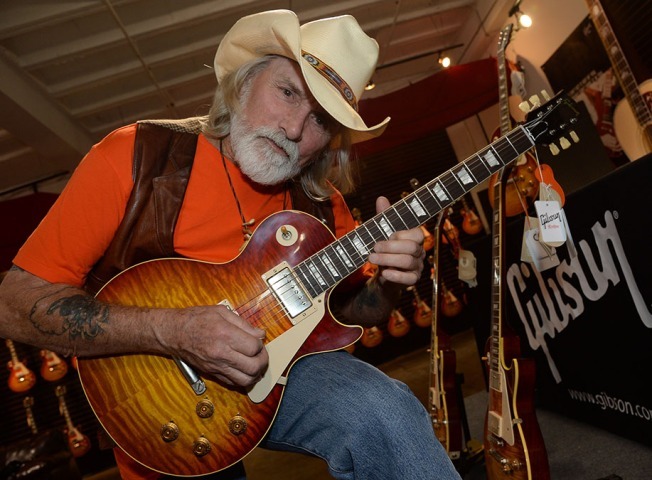 This May 19, 2014, file photo shows recording artist Dickey Betts at a news conference for the Gibson Custom Southern Rock tribute 1959 Les Paul at the Gibson Guitar Factory in Nashville. Allman Brothers Band guitarist Dickey Betts is in "critical but stable" condition after slipping and cracking his head while playing with the family dog in Florida. The Dickey Betts website says the "Ramblin' Man" singer-songwriter has been sedated since the accident Monday evening in Sarasota. The website says Betts is scheduled to have surgery Friday to relieve swelling in the brain. His wife, Donna Betts, said on the website that she and his children are by his side and that the family "appreciates all of your thoughts and prayers during this very trying time." Last month Betts suffered a "mild stroke" and had to cancel upcoming tour dates. A few weeks ago longtime friend David Spero posted that Betts was responding well to treatment and was "raring to go."